This will be the last opportunity for the 2016 season to complete this course, so register now !! 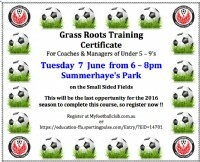 This course encompasses the ‘Discovery Phase’ of the FFA National Curriculum and is aimed at coaches training 5 – 9yr old players. The completely practical course encourages the coach to develop practices that are based on FUN, with an emphasis on natural development i.e. learning by PLAYING football. Organising FUN football exercises, is the key to helping player’s build a love for the game. Another highlight of the course is that the coaches are exposed to basic rules of the game as well as tips and hints on building a football culture in a completely practical setting. Coaches & Managers, parents and future coaches welcome!! Please register your attendance at the links provided above or contact coaching@springwoodunited.com.au for more information.